Well, it is time to start thinking about Christmas shopping if you haven't already. This is the start to my Christmas shopping guides to share with you some of my FAVORITE finds. Hope you enjoy! I am ADDICTED to beautiful children's books. In order to manage this addiction - we use the library. A lot. I see beautiful books on instagram, pinterest, amazon.. where ever and then I request them from our library. I have found that just because they have lovely art and beautiful words - they are not always as big a hit to the kids. And really, that's who they are for. So I've done my homework. 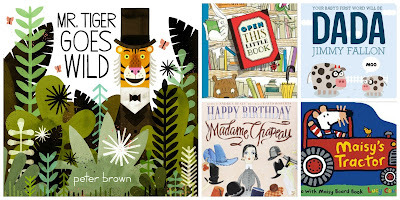 Here are the books that I LOVE to read and that my kids LOVED to listen to. A win win. Maisy's Tractor - Getting books for Gus is HARD. A book needs to be about trains, trucks or cars for it to hold his attention. Sometimes he goes for books that have flaps or mirrors (the interactive type of book) but that's hit or miss. This is a tractor book so he loves it. I like that it has other things I can identify for him - like cows, sheep, etc. Your Baby's First Word Will be Dada - Ok, so this book is an exception to my above rule about Gus and trains, trucks and cars. He loves this book. He likes to flip through the pages going "Dada, Dada, Dada" as if he is reading it. We keep it in the car to distract him when he's fussy. I bought it because Jimmy Fallon wrote it. That's just like an added cool bonus now. Happy Birthday, Madame Chapeau - This book was a win win for us. It had beautiful words, beautiful images and a great story line. I loved it. Lucille loved it. Another library book that she'll be getting for Christmas. From the author of Rosie Revere, Engineer which is also a great book. Open this little book - What an interesting book. The pages get smaller and than larger as you go from opening books about books about books. A very quick read and if your little one does well with paper pages - this concept could be for a very young reader. So cute and again, another one that Lucille loved from the library. 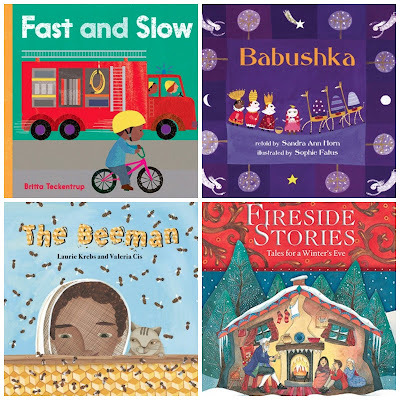 Of course, as a Barefoot Books Ambassador, I have to share a few from Barefoot. Now thru November 30th you can get 25% off your order with code: THANKFUL. While that code isn't good anymore - if you spend $60 or more in December you can get $10 off your order! Code: TENOFF. Fast & Slow - This one is Gus' favorite. Of course its a book focused on transportation so it has a car, a train, a tractor, a bus, a boat.... and on and on. He loves to identify each thing and the colors are so bright and attractive! Babushka - This is a beautiful story for Christmas time. The storyline is a woman who spends too much time focusing on the little things and starts to miss the wondrous things that are happening. Its a great reminder for parents as they read it - and Lucille likes the artwork. The Beeman - Considering my own fascination with bees - I have to include this book. Its a great book for teaching littles more about the importance of things in nature (especially those bees!) Love the rhyming of the book and the recipe at the end is a special treat! 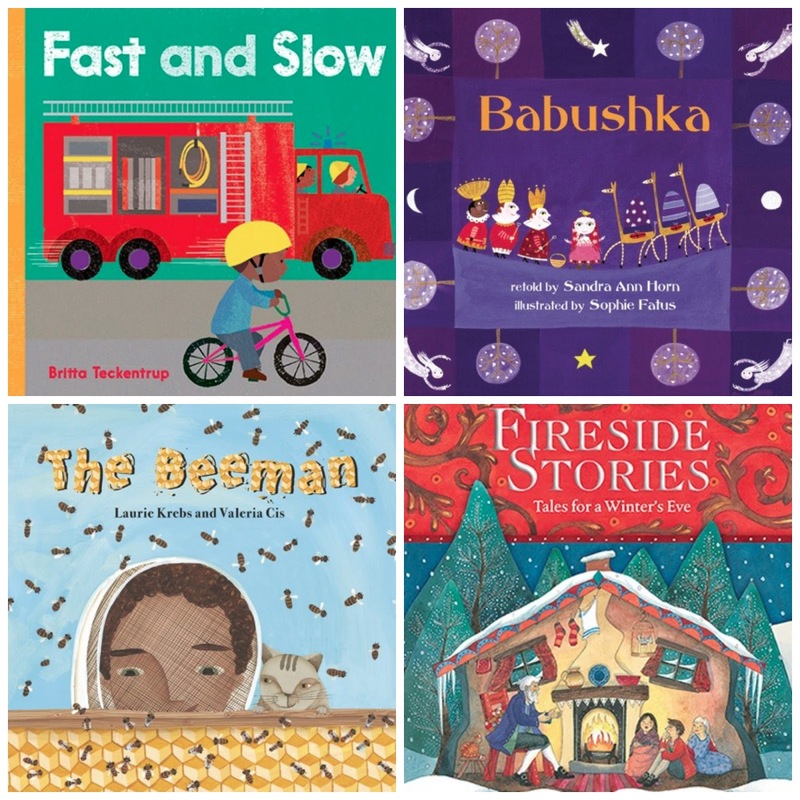 Fireside Stories - This collection of 8 stories from various parts of the world is a great gift for a book loving family. They are great stories to be read out loud and enjoyed by all ages. Another fun Christmas story. Ok! Enjoy my recommendations. More shopping lists coming soon. Any books you LOVE?